Home » News » Twitch Prime Loot Coming to Apex Legends? Twitch Prime Loot Coming to Apex Legends? 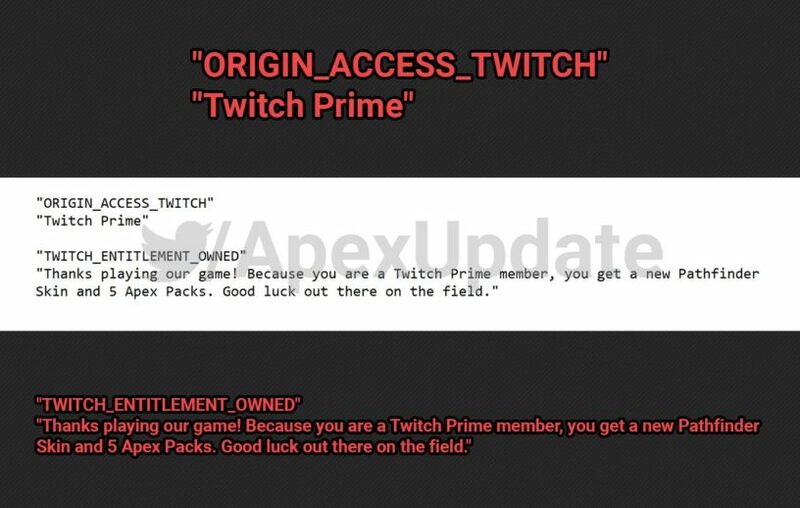 Apex Legends could be giving out Twitch Prime rewards in the near future based on a leak! It looks like Apex Legends could be joining previous games like Fortnite in taking advantage of Twitch Prime and giving players some pretty nice rewards. Lots of big games have taken advantage of this platform to give player's free stuff like Hearthstone, Warframe, and more! If you or someone you know has an Amazon Prime account (you get free 2-day shipping and other perks), you can connect it to your Twitch account to get Twitch Prime. This gives you some nice perks on Twitch including a free Subscription every month you can use on your favorite streamer, free games, and also access to free downloadable cosmetics and various other things offered by game companies. If you haven't used this up already, you can get Amazon Prime for one month for free. I wouldn't use the free trial yet if you want the Apex Legends rewards because we're not sure when the offer will take place yet! It's out live now, check out our updated post on it: Apex Legends Twitch Prime Pack! A dataminer on Twitter has found some text buried deep in the files of the game that shows we're likely to get a Twitch Prime offer soon. The rewards look to be pretty nice actually, we'll be potentially getting five free Apex Packs, which you can get Legendary skins and even Wraith's Heirloom set that includes the sweet knife! It'll also include a new Pathfinder skin that we aren't quite sure what will look like yet! Here's the leak from the files, credit to ApexUpdate on Twitter. Thanks playing our game! Because you are a Twitch Prime member, you get a new Pathfinder Skin and 5 Apex Packs. Good luck out there on the field.